Our Yolo Community-Wide Garage Sale was a wonderful success thank to tremendous support from the community and the Yolo County Library to create another nice event. 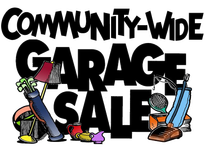 In addition to our sale under the trees at the Yolo Branch Library, an amazing 27 homes set up garage sales. Despite the heat wave, a nice crowd visit Yolo picking up bargains, seeing old friends and meeting new ones. It was wonderful to see the community come together with the Friends and the Library to create another event with a warm community feel. Many community volunteers helped with set up the Friend's sale and then stayed to help during the day with others returned to help with clean-up. We had a nice size crowd come despite the predicted heat - thanks to the article in the Daily Democrat, social media, postings by the County library and flyers posted in Woodland, Dunnigan, Zamora, Knights Landing, Robbins and Yolo. We raised a little over $800 ($600 from the Friends sale, $270 from registrations for individual sales, minus $50 in expenses). Our thanks to Jessie Andrade who suggested this excellent idea to Sue Billing. Jessie then joined the event committee with Jess Andrade, Roy Wilson, and Rick Hernandez who planned the garage sale with invaluable support and guidance from Sue Billing. The amazing Friends chipped in with goods and/or equipment for the sale and help with event. And last - but not least - thanks go to the Yolo Fire Protection District for making their shed available for receiving, pricing, sorting and storing goods for the Friends' sale. The combined effort resulted in another successful event.